Roughly a month old and in place of a once seldom open cafe, Made in Camden is the onsite restaurant at the Roundhouse. As expected, just before and right after shows at this performance venue (the Royal Shakespeare Company's settling in at the moment), Made in Camden's stylish but comfy dining area and bar get slammed. However, the rest of the time it exudes a laid back and roomy vibe. Indeed, lunch might be an ideal time to visit as we did today upon invitation. Highlights from our lunch included scrummy baked eggs, spicy tomato, greek yoghurt and sourdough (£8 or £9.50 with grilled chorizo … and you'll want to go with the tasty chorizo). The dish served a trio of diners well as a starter but would be a brilliant and substantial main for one. We reckon if there's a second visit, we'll order that one again. 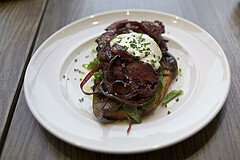 Seared onglet steak sandwich with (especially creamy) horseradish cream and balsamic red onion (£9.90) was filling and flavourful as well. We also had a taste of MiC's home made chuck steak hamburger (served with caramelized onion, cheddar, chilli jam and fries for £9.90). Compact and peppery, it was pretty alright. The fries were done up nicely too. Too stuffed for a proper attempt at dessert, we somehow found the room for a bite of chocolate and Armagnac cake (£2.50) and were sorely tempted to return for a peanut parfait with chocolate mousse and salted butter caramel (£5, not available at lunch). Coffee at MiC is worth mentioning. Roasted at Caravan on Exmouth Market, it's quality stuff. We very much appreciated the umph of the double espresso (£2.20) that ended our meal. Quick friendly service (during our midday, snowy Tuesday visit) and a pleasantly casual atmosphere add to the reasons we're happy to rec this restaurant – whether you're at the Roundhouse for a show or not. Made in Camden is located at the entrance to the Roundhouse on Chalk Farm Road (NW1 8EH). Visit www.madeincamden.com for details.